In order to effectively address climate change mitigation issue, it is necessary to achieve low-carbon growth all around the world by mobilising technology, market, and finance adequately. Recognising this necessity, the government of Japan has proposed the Joint Crediting Mechanism (JCM) as a means to facilitate the diffusion of leading low-carbon technologies, systems, and so forth in developing countries. Contributing to the ultimate objective of the UNFCCC by facilitating global actions for GHG emission reductions or removals. This scheme was launched in 2013. The scope of the financing includes facilities, equipment, and vehicles which reduce CO2 from fossil fuel combustion as well as construction cost for installing those facilities. 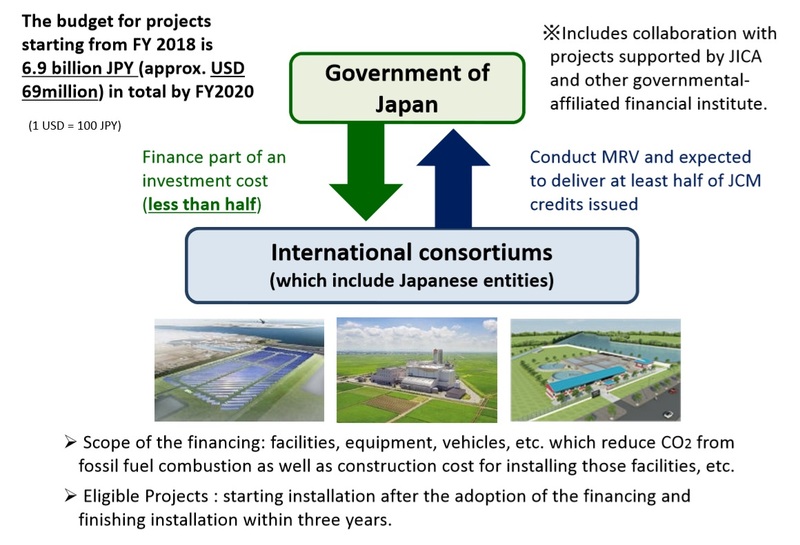 Through the programme, Ministry of the Environment, Japan (MOEJ) financially supports part of the initial cost (up to half), on the premise of seeking to deliver at least half of the issued JCM credits to the government of Japan. The budget for projects starting from FY 2018 is 6.9 billion JPY (approx. USD 69 million) in total by FY2020. This scheme was launched in 2015. The purpose of the scheme is to implement activities for REDD+ and use them for contributing to achieve Japan’s emission reduction target through the JCM. The budget for FY2016 is 80 million Japanese Yen (Approx. USD 6.7 million). At least half of JCM credits issued are expected to be delivered to the government of Japan except for the amount which is allocated to the partner country based on its legislation.